Jose Roberto Reynoso and Galip. Photos © Sportfot. Wellington, FL – March 18, 2017 – Brazilian Olympian Jose Roberto Reynoso and Galip were the winners in Saturday night’s $130,000 Horseware Ireland Grand Prix CSI 3* during week ten at the 2017 Winter Equestrian Festival (WEF) in Wellington, FL. The pair topped a six-horse jump-off over U.S. Olympic team silver medalist Kent Farrington and Creedance in second and young rider Eve Jobs (USA) riding Tiny Toon Semilly in third. Stella Styslinger of Birmingham, AL and Mckayla Langmeier of East Granby, CT rode Cassanto in the Bruno Delgrange Large Junior Hunter 16-17 division to earn the championship title. Styslinger rode the striking chestnut to a second place finish in the under saddle class, and on Friday, while Styslinger was away at school, Langmeier guided Cassanto to first and second place finishes over fences. 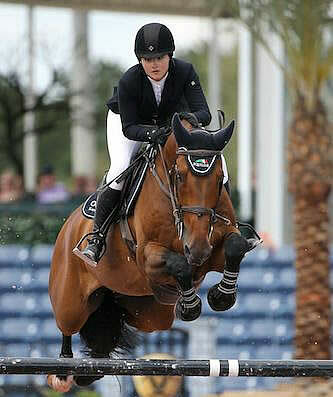 Emma Kurtz of Wellington, FL and Stellar settled for reserve honors just one point overall behind the leader. The duo won two over fences classes and placed fifth in another. Kurtz started riding the coming seven-year-old Hanoverian mare by Quintender at the beginning of the winter circuit and has found much success with her, earning the championship title in the division during weeks four and seven.